Shibata, S. (2016). Extensive reading as the first step to using the SALC: The acclimation period for developing a community of language learners. Studies in Self-Access Learning Journal, 7(3), 312-321. 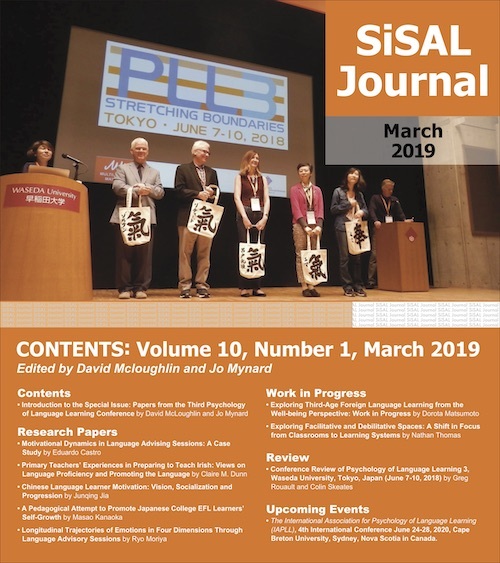 This paper describes an example of how to bring language learners into a self-access language learning center (SALC) in a Japanese university. A number of factors affect learners’ decision making about whether or not they use and continue using the SALC. In the context of lower interest in studying abroad or using English in jobs in the future, it may be necessary to consider setting up a clear purpose for students to come to the SALC. From the reflections on the last five-year implementation of extensive reading (ER), connecting classes and the SALC with an ER system seems to play a significant role in scaffolding their first SALC encounters in the current context, helping them go through the acclimation period leading to not only ER but also other usage of SALC. Many self-access language learning centers (SALCs) are established for the purpose of helping learners with their language learning, and the pedagogical rationale may vary depending on their associated institutions. Each SALC tries to attract users in its own way: some use advanced technologies (Reinders & Lázaro, 2007), and others implement SALC activities into their curriculum in order to scaffold students’ first SALC encounters (Croker & Ashurova, 2012). In the Japanese university described here, students showed low interest in studying abroad, using English for jobs in the future, or even just being familiar with movies, dramas and music from English speaking countries. Therefore, it was necessary to consider what would attract students to make use of the SALC. As Wenger, McDermott and Snyder (2002) describe in the theory of communities of practice, “groups of people should share a concern, a set of problems, or a passion about a topic.” It was important to find what would be something that students could share with their friends. Reflecting on the last five-year trial, in the case of the university described in this paper, it turned out to be extensive reading (ER). The SALC described here was established in 2008 to offer administrative services and to support students with questions related to English. Although there was no official mission statement when it was established, from meetings with university staff, I understood the main aims of the center were to offer administrative services and to answer students’ questions related to assignments from the classes they take or to learning English. As an administrative service, the SALC existed to deal with application forms and fees for several language tests and to offer support for the application process for several studying abroad programs. However, from my previous experience running a SALC in another university, I did not consider a SALC as a place only to offer administrative services and to answer questions related to assignments. In accordance with what other researchers in the field of self-access language learning and autonomy have suggested (e.g. Benson, 2007; Gardner and Miller, 1999), I believed that a SALC could be a place where language learners can improve English proficiency and at the same time become autonomous learners with various support. Therefore, I worked on finding a way to re-create the SALC as a place to scaffold autonomous learning and improve students’ language proficiency through providing them with advising sessions and other activities. The SALC is located in one of the three campuses of a university in Shizuoka prefecture, Japan, housing different faculties. The campus where the SALC is located is home to the faculty of Foreign Studies with two departments: English, with 100 to 130 students each year and Global Communication, with 60 to 80 students. English major students are expected to focus on the language and cultures of English speaking countries, and Global Communication major students focus on cultures of China, Korea, Brazil and Spanish-speaking countries, rather than learning English. The SALC is open from 9:00 a.m. to 6:00 p.m. Monday through Friday and available for any students to use. One full-time administrative staff member has been employed to work in the SALC since its establishment. Two teachers, including myself, were hired to work in the SALC for two days a week in addition to teaching five to six classes per week. Unfortunately, four years after its establishment, the number of teachers was reduced to one, so for the moment, I am the only teacher working in the SALC. We also employ seven to eight student teaching assistants (TAs), who are third or fourth year students, with high English proficiency along with experience of studying abroad, taking a teacher’s license course, or eagerly practicing ER. There is usually one TA on duty from Monday through Friday. However even during busy hours, only one TA is allowed to work each hour because of financial constraints. Any student at the university can use the SALC, but more than 90% of users are those who major in English. It may be because more students enroll in the English department and because we have more materials for learning English. We also have study group meetings for 90 minutes a week for other languages, such as Spanish, Chinese, Brazilian Portuguese, and Korean, which are mainly attended by Global Communication students. We also provide books for those language tests, help students to register for tests applications, and support study abroad programs for those related countries. However, as the majority of users are English majors, descriptions in this paper will focus mainly on them. The English proficiency of the English major students varies from 100 to over 900 on TOEIC. Approximately 20% of the English major students decide to take the teacher’s license course when they are in the second year, and 30% of them study abroad for one month to eight months. However, based on the brief questionnaire that I distribute in my classes every year and impressions gleaned through casual interactions in the SALC, many are likely to have chosen English as their major because of reasons not so strongly related to English itself. For instance, their siblings graduated from the same department, they wanted to go to a university in Shizuoka but there weren’t very many choices, or they simply like English compared with other subjects but do not intend to go abroad or get a job using English. Although they worry about their TOEIC scores, they are not motivated enough to start language learning on their own. Instead, they prioritize the completion of assignments from the English related classes they take. According to the statistics reported by Ministry of Education, Culture, Sports, Science and Technology in Japan (MEXT) in March, 2016 (MEXT, 2016), the number of university students studying abroad has been increasing. In 2011, 53,991 students studied abroad, and the number increased to 81,219 in 2014. However, the situation was different in our university. Year by year, more and more students show no or little interest in studying abroad or using English in the future. For instance, the actual number of students who studied abroad for six months or more has gradually decreased from 14 students in 2007 to only four in 2015. Such tendency has given me the opportunity to reconsider how the SALC can support students who have no specific purposes to work voluntarily toward improving their English skills or getting more interested in foreign cultures. Without specific reasons and strong motivation to study English, they wouldn’t use the SALC voluntarily, so we needed to consider how we could attract and encourage them to step into the SALC. As I discussed in a previous study (Shibata, 2010), Japanese language learners tend to have an invisible obstacle preventing confident usage of new facilities: students may be curious but not brave enough to step into the SALC on their own without a clear purpose. My research showed that a number of factors affect learners’ decision-making about whether or not to use the SALC. Some students believe the SALC is not for them but for specific people: for instance, for those who are studying abroad, or those who have high English proficiency. They haven’t yet built up an identity as a member of the SALC community. As Wenger (1998) defines community membership, to be a full member, it is important for students to feel they are in familiar territory. In another study (Shibata, 2012), I discussed the importance of acknowledging the necessity of an “acclimation period” until language learners are able to use a SALC feeling comfortable, accepted, and competent. Frequent face-to-face casual contacts should remove such an invisible obstacle (Shibata, 2012). Taking these two issues into account, I planned several activities which would be low face-threatening and have a clear purpose for students to come to the SALC. Of all the activities tried in the current context, the one with the strongest impact has been ER. When I check their ER journals face to face in class, I have a short conversation on how well they were reading, how they were enjoying it, which book they liked that week, whether they read every day, or whether they had any trouble with ER. Many students ask which book to read next, so I introduce some specific books to them or suggest they should visit the SALC in order to look for suitable books together. If they have some difficulties with ER (and it is difficult to give advice in such a short time during the class), I encourage them to visit the SALC. In both cases, it is only a suggestion, so some students visit SALC right after the class or later the following week, and others don’t. We have almost the same selections of ER books both in the library and in the SALC, approximately 4000 books each. From observation and interactions in the SALC, students seem to prefer the SALC because it is easier to find books, they can receive support to find a certain book, and they can ask more questions related to ER to the teacher, TAs, and their friends. Now the students in the highest level class read 800,000 words a year on average, the middle 500,000, and even the lowest read 300,000 words. The majority of the students read more than the ideal amount that was proposed by researchers (e.g. Beglar & Hunt, 2014; Nation, 2009), which is 500,000 words per year, in order to improve English skills. The amount students read has increased substantially since 2011, when students only read 150,000 words a year. Although the proficiency of the incoming students is similar to that of the students five years ago, according to their TOEIC scores, the amount they read has increased drastically. As I discussed in another study in 2015 (Shibata, 2015), having access to books alone does not guarantee that students will read extensively. With a reasonable scaffolding system, many can actually read a decent amount and make ER a habit. There are many factors to help students to read one million words a year (Shibata, 2015), but one of the most important factors is a learner community, where students can receive advice on ER, where they can share pleasure and difficulty of ER, and where they can gather information and receive support for ER and studying English. Encouraged by ER, the number of users for other activities has also increased in the last five years. In 2011, our first ER year, we had 18.9 SALC users a day in June for the other usage, not ER, but in the same month in 2016, 77.9 students used the SALC a day for the other usage, suggesting ER has helped encourage students to be interested in more SALC usage. ER is likely to be playing a significant role as the first step into the SALC (a clear purpose to visit the SALC) and repetitive interactions with staff and TAs (an acclimation period). Interactions typically start from which books students should read next, and then move on to how their ER is going, whether they have any difficulties in ER, and finally progress to what their purposes or goals for language learning are. Such repetitive casual contacts are considered examples of “mico-counseling.” In a previous study (Shibata, 2012), I discussed the importance of micro-counseling sessions, which are language learners’ casual contacts with teachers or TAs. Micro-counseling sessions may lead students to other SALC usage including macro-counseling sessions, longer and more serious advising sessions. For example, some students ask me only about books for a few months and show no interest in further conversations, but then eventually they ask how to study English. Then I can finally have an advising session and introduce TAs or other SALC users, or other SALC usage. One of our TAs is a good example of a multi-purpose SALC user. When he was a first year student, he showed no interest of studying English and didn’t work so hard on ER. He asked me how to study English once in the class but didn’t end up coming to see me in the SALC for an advising session. However, whenever I saw him borrowing books in the SALC, I greeted him and kept asking how he was doing. When he became a second year student, he asked me to check his progress every week in the SALC. We decided to check how much he read or what level of books he was reading and how he was doing on the TOEIC textbook we chose together. We occasionally had advising sessions, and I introduced English conversation practice sessions and gave him opportunities to talk to TAs and other students in the SALC. Eventually he got interested in studying abroad, went to the US for two months, and came back to be one of our TAs. Now he is a TA and at the same time a SALC user. He asks me for some advice if necessary, participates in English conversation practice sessions, and studies for some tests such as TOEIC, making use of the SALC. Borrowing books is a low face-threatening activity, so students can come into the SALC with confidence. They have a specific purpose to come and do not necessarily have to talk to anyone if they don’t want to until they are ready. Staff and TAs can communicate with students when they check out or return books regularly and frequently, which helps students feel more confident about using the SALC. Students can build a community of language learners through talking to their friends or TAs about books and difficulties they face in ER. They have a chance to meet role models of language learning and to see how other students enjoy or struggle with ER and other language learning activities. What attracts students really depends on the context and complexity of numerous factors. What is important is to find out what students could have in common to create a community of language learners. As Wenger et al. (2002) emphasize, groups of people should share a concern, a set of problems, or a passion about a topic. In the case of the university described here, it was ER, and through ER, students could share not only their pleasure about ER but also difficulties. In addition, students also need an acclimation period to become confident members of a SALC community. Although further research is necessary, the following are suggestions for those facing similar circumstances when they consider conditions for a springboard to engagement to a SALC. Think of a low face-threatening activity that could be a specific purpose for students to visit a SALC with confidence. Think of something that students could have in common with their friends so that students can share pleasure or difficulties. Think of something for which students can visit the SALC regularly and frequently so that they can experience an acclimation period and micro-counseling. In the case of this university, that springboard has been extensive reading. Satomi Shibata is an Associate Professor in the English department, the Faculty of Foreign Language at Tokoha University, where she teaches elementary English education and English skill classes. Her research interests are learner autonomy, motivation, self-access language learning, and extensive reading. Benson, P. (2007). Autonomy in language teaching and learning, Language Teaching, 40(1), 21–40. doi: 10.1017/S0261444806003958. Nation, I. S. P. (2009). Teaching ESL/EFL reading and writing. New York, NY: Routledge.